Meet Terry Roses! Then learn how to spot marked cards in live casinos! I just met Terry Roses at the 2018 Upper Midwest Intelligence Gathering (UMIG), which is the intelligence unit of casino security and surveillance personnel for midwestern casinos. I was the main speaker there, scheduled for the second day of the two-day conference. I had no intention of being there the first day, until a Minnesota surveillance director emailed me about a guy who was going to do a presentation that first day all about identifying marked cards in casinos. That guy was Terry Roses, and after hearing about his "secret lab," I became so intrigued that I made a last minute change of airline tickets to be able to get there in time to see Terry's presentation the day before mine. And boy was it some presentation! The best and most interesting I´ve ever attended at any game protection conference. Terry perfectly presented his material, interweaving his own life and how he developed a keen interest in marked cards with that of displaying several casino-cheating gadgets and finally his own invention, which is a fabulous little handheld gizmo with which ALL daub card-markings can be seen and identified on the spot. I have been told by several high-profile surveillance executives in Las Vegas that it is the BEST DEVICE of its kind ever to hit the market. I then had the unexpected pleasure of Terry helping me with my own presentation! He was tremendous! And Terry, who goes by the name of the "honest cheat," is just that. I mean this guy is even more honest than he looks. He is also humble, so much so that he had to be pushed to aggresively market his product. It is called the Inspecta Card Scanner and you can see it by making an appointment with Terry. Perhaps he'll show you his secret lab! So I urge all surveillance departments that want to be able to detect marks on suspicious cards on the spot to get a hold of Terry's Inspecta Card Scanner. It will serve you well! I published the article one week ago. For those of you who have not read it, please find it here. First and foremost, publishing this article has been the proudest and happiest moment of my life, bringing much more joy and satisfaction than the five books and hundeds of magazine articles I have written and had published. The reason is because after ten years of the unjust criticism I suffered at the hands of Willy Allison, Jeff Murphy and the World Game Protection Conference, not to mention the hundreds of thousands of dollars in income that I surely lost, I finally got the chance to air out my frustration to all of you--and to my great surprise I was utterly well received. I sincerely want to thank each and every one of you who took the time to read it, as it was indeed lengthy, winded and full of links to even more lengthy and winded articles. Kudos to those who actually got through all those links! And to those of you who publically commented in my favor and reshared the article, especially those currently in high surveillance positions, I appreciate your courage in doing so as you were openly going against the grain--but not nearly as much as I had thought. You will see what I mean down the page. But first the statistics. The views and full-reads of this article continue steadily as I type these words. They have already been quite numerous. I was hoping for lots more but very few people were willing to reshare the article, let alone publish the positive comments on the forum that they sent to me in private. I certainly understand that as the Willy Allison WGPC machine is very powerful, and upsetting it can hurt people's pocketbooks and reputations, by way of losing their jobs and/or contacts. So again, for those few of you in these positions who publically supported me with your "likes," comments and reshares of my article, I owe you a special debt of gratitude. The reluctance of the mass readership to do so can be compared to the situation right now in the US Senate, although I do not want to get political! Okay, a lot of views...but just 45 "likes" and 25 reshares. Proportionally speaking, those are very low numbers. There are also only a half-dozen comments, the number actually shown overstated by repeaters and my own replies. But due to the controversial nature of this article as well as its David-against-Goliath nature, the low response in those areas is quite understandable. However, there is one facet to the whole response spectrum that is unbelievable--and I mean so unbelievable that I would have bet my house to win a dollar on its never occuring. That is: Out of all the readers thus far, not one...I repeat...NOT ONE...defended or supported Willy Allison. I DID NOT RECEIVE ONE SINGLE COMMENT, PUBLICALLY OR PRIVATELY, DEFENDING WILLY ALLISON! I would have expected dozens of them, at the least. Then there is one more astounding facet to the whole response spectrum--and on this one I would have bet my summer house as well (if I had one) to win the same dollar on its never ocurring. That is: Out of all the readers thus far, not one...I repeat...NOT ONE...attacked or ridiculed me. There was absolutely none of that "you're an idiot...you know nothing about game protection...you're incompetent" stuff that Okada Resort AVP Tim Gilbert threw at me, propelling the article in the first place. There was one casino operations director who called me a "douche" in his message, but he stated his reason for doing so was that I was an ex-cheat who got a lot of dealers and floor personnel fired. I cannot change who I am or what I did, but I assured the CO director that I never caused one casino employee to lose his or her job, and that is the truth. 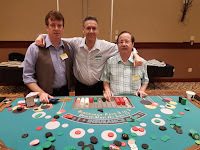 It it also the truth that for the past 15 years, through my book "American Roulette" and training table games and surveillance staffs, I have been providing a valuable service to casinos. But all in all, what happened? How is it possible that after being badmouthed by the entire WGPC community for more than a decade not one WGPC-goer offered one iota of criticism against me. If you examine the public comments as of this writing, you will see just two negative comments, both of which have been corrected and turned into positives by the writers of those comments. Baron Stringfellow, who criticized but did not attack me over a years-ago blog article I wrote mentioning him in a disrespectful light, quickly received my apology which was due. And Baron quickly turned his negative comment into a reshare for me. How many of you know Darrin Hoke? If you remember, in my article I offered my apologies to that indeed talented surveillance professional for having ridiculed him, even though I had never met him. The last thing I expected was any recognition at all from Darrin. Well, guess what? Darrin gave my article a "like"! Can you believe that? And if memory serves me correct, he did speak at the WGPC. And Darrin, if you would, please accept my Linkedin invitation. I would love to have you as a connection. So...what does all this mean? You know, I don't know. My hope is that it means that there are lots of you who read the article and believe me and accept the evidence trail I put forth to prove the conspiracy against me. It is also my hope that lots of you give credence to my statements that the WGPC is overbloated and really serves Willy Allison much more than the Game Protection Industry. But I have to pull back here and accept another possible explanation. Maybe the omnipotent Allison put the word out to leave Richard Marcus's article alone, so it gets fewer and fewer readers and goes away quicker, and then we can brush him under the rug and maybe he'll just go away...Hey, you like that one, Willy! But you know what, I´m really pretty much doubting that happened because, as I said, I did not get any negative comments in private. And I don't think Allison would object to any comments defending him on the public forum. So If anyone challenges this by posting now against me or in favor of Allison, you would have to question the validity of those comments suddenly appearing after the publication of this second article, wherever they may be posted. 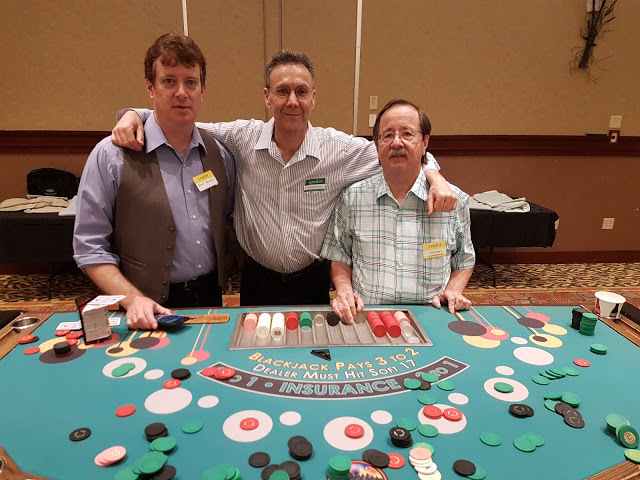 1) The general game-protection community as a whole has come to the realization that Willy Allison is much more about himself and his brand than he is for the betterment of the game protection industry that he claims. 2) Not a whole lot of people think very highly of Jeff Murphy, especially in Las Vegas. Now to something I learned from those people who wrote to me in private, and I was completely unaware of it as I have more or less been banished from the US game protection industry for a decade. One of my worst detractors who has spoken at the WGPC, and who has badmouthed not only me but others as well over the years, was himself fired from a high-level surveillance position after allegedly receiving kickbacks from vendors selling surveillance equipment to his own casino. The said individual is still working in a high-level surveillance position, much to my bewilderment. And he has caused several high-level surveillance people to lose their jobs in the furtherance of his own agenda while he consulted to surveillance departments in casinos across the US. I of course cannot mention his name, but I would bet a large percentage of you know exactly who I am talking about. He is a real piece of garbage. I wonder if his current employee, far from Vegas, knows about this. Maybe I'll drop a dime on 'em...and I will have more to say about this rotten apple in an overwhelmingly honest surveillance industry. Stay tuned. As the months go by leading up to the 2019 World Game Protection Conference in March, I will be steadily commenting on it. I'm sure I will have lots to say about the 2019 lineup of speakers. I'm also sure there will be several smoke-and-mirrors presentations, and the usual repetitive and outdated ones. But if there are fresh or relevant speakers, I will be the first to say so. I certainly don't want to see casinos wasting their money on the WGPC, but there are some quality casino people who do speak there. One last thing: Maybe by seeing the lack of comments defending Willy Allison and Jeff Murphy on my last article, more of you will publically voice how you truly feel on this article.